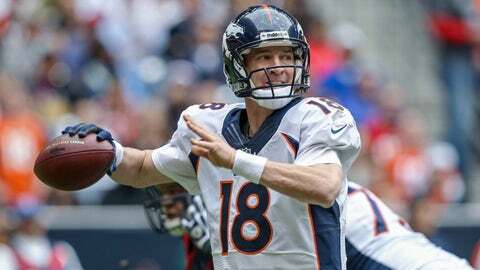 Peyton Manning vs. the Seahawks -- We can't wait! It’s never too soon to start thinking about the 2014 NFL season. And with the 2013 regular season wrapped up and the playoffs just days away, the NFL on Monday released next year’s opponents for all 32 teams. We know the who and where, just not the when. How’s this for starters? Many expect Peyton Manning and the Denver Broncos to hook up with Russell Wilson and the Seattle Seahawks at Super Bowl XLVIII (Feb. 2 on FOX); but if they don’t at least they are guaranteed to meet in Seattle next season. Manning and the 12th Man — together at last. The Broncos also have a big AFC showdown at New England and get to host the San Francisco 49ers among their non-AFC West games. What about this matchup of the top two picks from the 2012 draft? The Indianapolis Colts and Andrew Luck will host the Washington Redskins and RGIII. As for Drew Brees and the New Orleans Saints, who love to play indoors and in warm weather, well there are possible snow games in Chicago, Cleveland and Pittsburgh. We do know the dates of the three games to be played at London’s Wembley Stadium: Oakland vs. Miami on Sept. 28, Atlanta vs. Detroit on Oct. 26, and Dallas vs. Jacksonville on Nov. 9. Of course, not every non-divisional game will be worth waiting for: See Houston at Cleveland, Buffalo at Oakland, St. Louis at Tampa Bay. But it’s the NFL. A year ago, who had the Chiefs (2-14) and Eagles (4-12) getting into the playoffs this season?